In the days leading up to President Barack Obama’s 2014 visit to Northwestern, neurobiologist Thomas Bozza began to see an influx of four-legged visitors to campus — dogs trained to recognize the chemical signature of explosives. To address this knowledge gap, Bozza’s lab studies mice to learn how the nervous system encodes molecular information, and how neural circuits give rise to learned and innate olfactory-driven behaviors. This summer, Bozza — along with postdoctoral fellow Adam Dewan and colleagues — published in Nature Communications a study identifying for the first time specific molecular receptors in the rodent nose that determine sensitivity to specific chemicals. 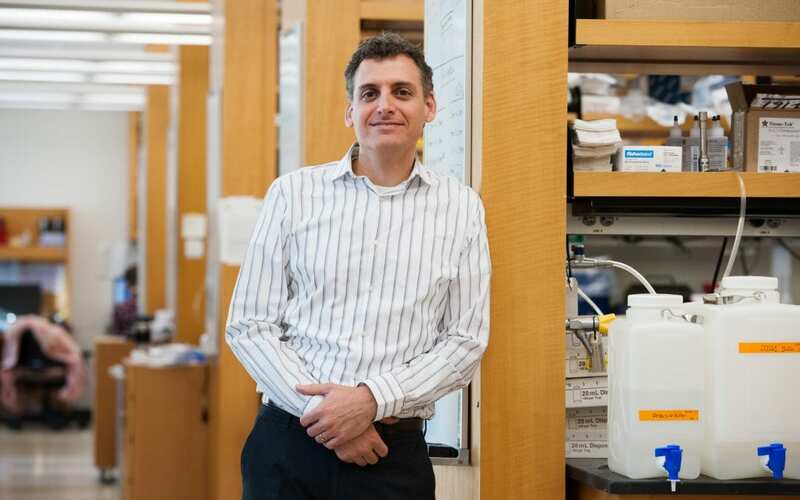 “This is a major advance in the field and has implications for designing machines or genetically engineered animals to sniff out explosives or illegal drugs,” says Bozza, who studies the molecular logic of olfaction in mice — the most genetically tractable mammal. Mice have more than 1,000 olfactory receptor genes and “strong” smells like the scent of a cat (think of coffee or rotting fish for humans) activate many receptors at the same time. For years, the widely accepted theory was that olfactory responses are “distributed” or redundant. If a smell activated 100 receptors and you took one of those receptors away, the other 99 compensate and make the loss negligible. “I’ve always been critical of this idea. If you don’t need all of the receptors, why is the repertoire of olfactory receptors so large? Individual receptors must contribute something,” says Bozza. Scientists have generally used highly concentrated odors that elicit responses from dozens or hundreds of receptors. And when you remove the most sensitive receptor for a given chemical, you change the animal’s threshold for detecting it. A 2014 publication in Science estimated that humans — and their 380 olfactory receptors — can detect 1 trillion smells. With two-and-a-half times the number of receptors, mice are likely able to discern many more odors. In this vast sea of receptors and ligands (the odor molecules that bind to receptors inside of the nose), the Bozza lab has been able to identify the highest-affinity ligands for particular receptors. This has allowed them to remove single receptors in mice and measure changes in odor perception. A prior study, published by lab members in Nature in 2013, showed that removing a single receptor prevented mice from avoiding the odor of predators. Their new study on sensitivity has implications for designing or augmenting biological olfactory systems for chemical threat detection. “If you want to augment an animal’s ability detect particular chemicals, it’s not enough to simply add more olfactory receptors,” says Bozza. “You have to make the most-sensitive receptors more sensitive.